One of the best things about the NBA is the diversity of playing styles. Every player is different, and even the most dominant superstars thrive in unique ways. That's clear when we watch, but it can get lost when we stare at scoring stats. Sure, everyone knows that James Harden leads the league in points per game, but that's only part of the story. If we break the court into 10 regions and calculate which players lead in buckets from each zone, we start to see the diverse talent emerge. Yes, Harden is a master scorer, but he can't hold a candle to Giannis Antetokounmpo in the paint. Nobody can. 1. 93 percent of his points come in the paint or at the line. 2. He leads the NBA with 55 unassisted dunks this season. Rudy Gobert ranks second with 23. Although 3-pointers are precious, dunks remain the most efficient play in the sport. 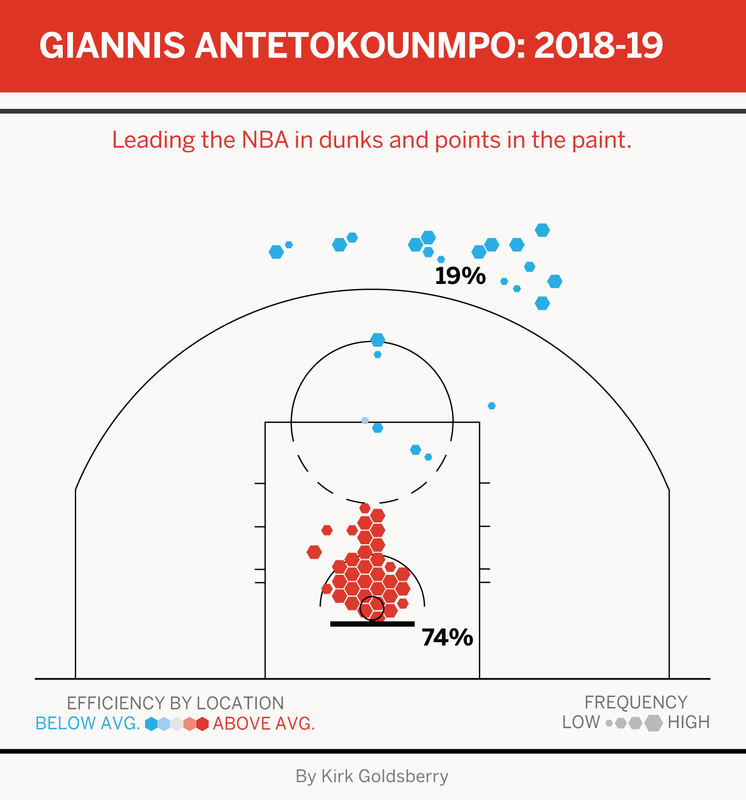 But dunks are hard to create ... unless you're Giannis, who is somehow averaging 4.6 per game. Giannis Antetokounmpo puts some nifty moves on the Raptors' defense on his way to the rim for a powerful jam. Giannis' interior proficiency is both fun to watch and super-effective. Of the 41 players who have taken at least 400 shots this season, Giannis is first in effective field goal percentage (eFG%) at 59.7. Over the past 10 seasons, only Stephen Curry and LeBron James have topped that monstrous eFG% when matching Giannis' usage. His game might be simple, but it's also unstoppable. 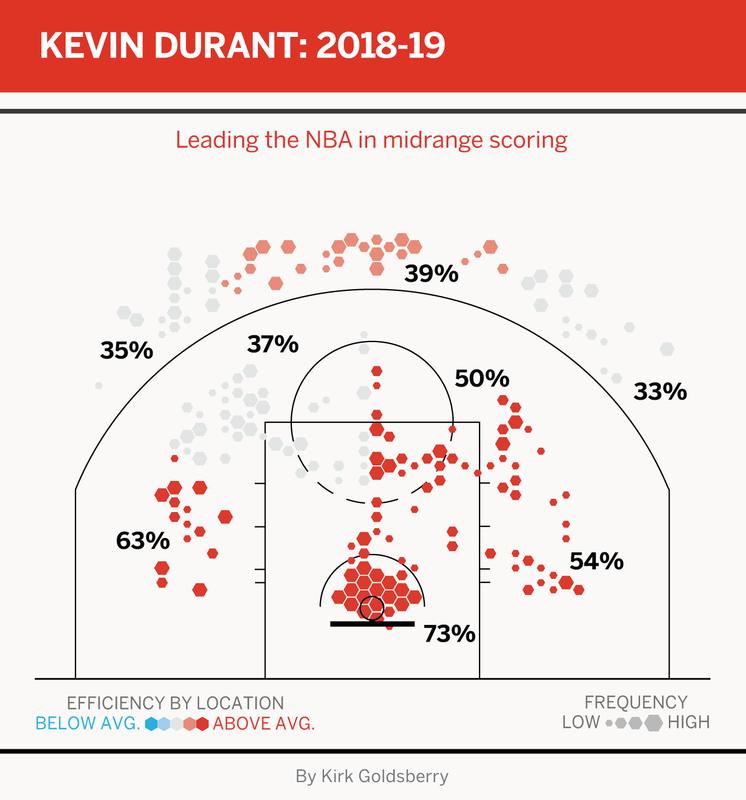 Midrange scoring might be a dying art, but it's still one of the signature skills for many of the league's most-talented scorers, including Kevin Durant and DeMar DeRozan. They both still love pull-up jumpers in the 2-point area and show up in two of these zones. Back in 2013, Durant told me that his favorite shot was the pull-up around the left elbow: "It starts at the top of the key, left-hand side -- dribble, dribble, stop and pop -- and it's kind of hard for defenders to recover because I can go all the way to the rim. So I just pull up and do a little fade right around the elbow. I've been working on that so much, I feel like that's my go-to shot." Well, he's crushing it over there by leading the league in scoring within that zone and dropping buckets 50 percent of the time. 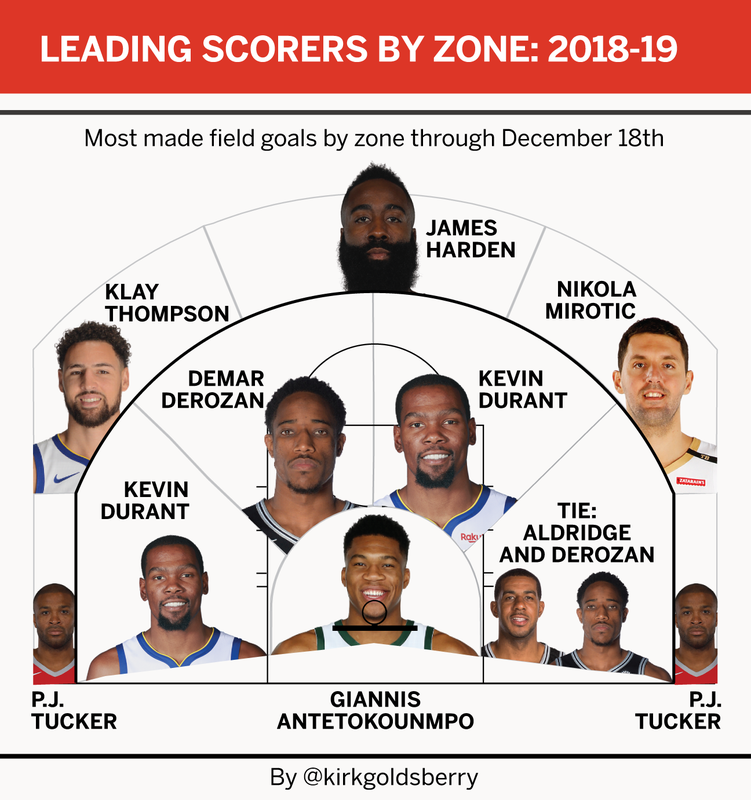 Durant might be the leading scorer in the midrange so far this season, but it's no surprise to see him joined by DeRozan and LaMarcus Aldridge. They both take more than 40 percent of their shots from midrange, per NBA Advanced Stats. If it's true that corner 3s are the smartest jump shots in basketball, PJ Tucker is the Albert Einstein of hoops. Tucker is the leading scorer from both corners. He has made 46 corner 3s in his first 29 games this season. But Tucker's success in the corners is a team accomplishment -- he's just the punctuation mark at the end of tactical sentences designed to create these opportunities. Corner 3s are the most assist-dependent shot on the court. More than 95 percent of corner triples involve assists so far this season, and every single one of Tucker's has come off the catch. Tucker's corner numbers are still an impressive individual accomplishment and a good indicator for the Rockets. 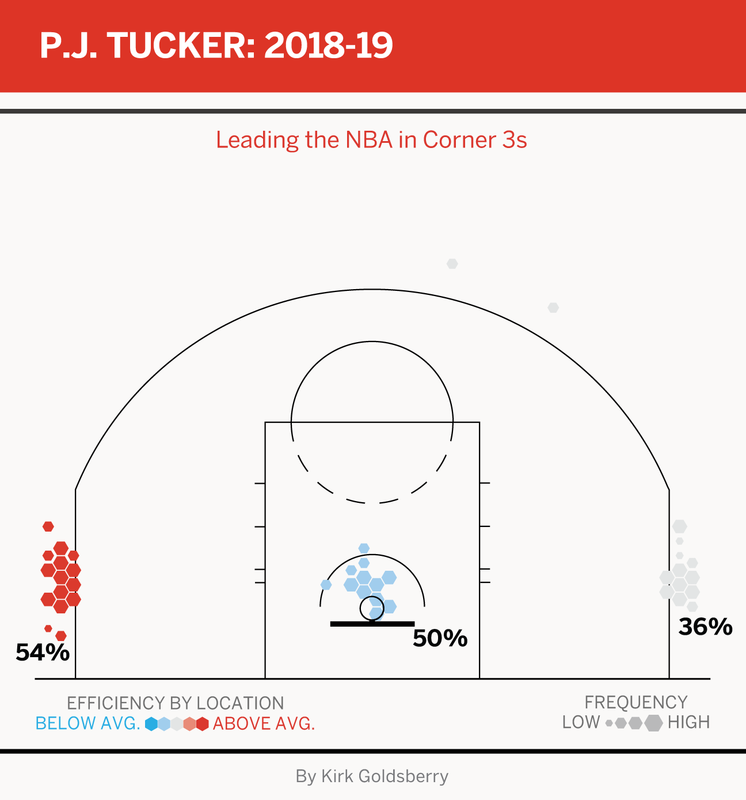 Tucker is now the preeminent corner specialist in the NBA: 81 percent of his 3s have come from the corners, and he has knocked down 46 percent of his tries from that area. What can you say about Klay Thompson? On most teams, he would be the primary option, but on Golden State, he plays third fiddle behind a couple of MVPs. Regardless, he is arguably the best catch-and-shoot threat in the league and loves the right wing, where he has already drained 33 3s. Thompson also leads the league by a wide margin in catch-and-shoot attempts on the move -- Klay's at 219; No. 2 JJ Redick has 137 -- while dropping a 54.8 eFG% on such shots, per Second Spectrum tracking. When the Pelicans landed Nikola Mirotic last season, they added a perfect stretch-4 to help them open the floor for their fast-paced style. Mirotic has thrived in New Orleans, becoming the Pels' leading catch-and-shoot specialist. His favorite spot is deep along the left wing, where he has drained 32 3s already this season while making 43 percent of his attempts. Harden might not be the superstar we love, but he's the one we deserve. No player has aligned his game to exploit the Moneyball margins more than Harden. The dude abides by the "3s, frees and layups" mantra more than any superstar we've ever seen. 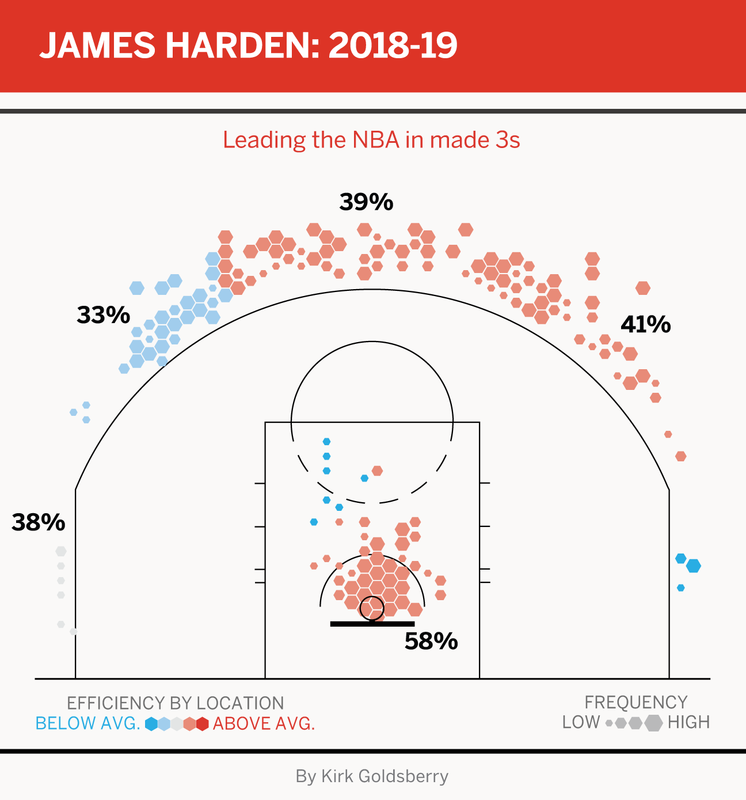 Aside from drawing whistles, Harden's signature skill is the step-back 3 (also, his patented double-step-back 3, which is still in beta testing). NBA 3s are assisted more than 80 percent of the time, but that doesn't apply to Harden, who leads the NBA in both made 3s and scoring, thanks in part to his raining down more unassisted triples than anyone in the league. Incredibly, Harden 3s are assisted only 12 percent of the time. He is to the unassisted 3 what Giannis is to the unassisted dunk. Love him or loathe him, between Harden's 3-point assists and his step-back, this fella is the single biggest 3-point factory in an NBA obsessed with 3-point production. All stats are current through the Dec. 18 games.